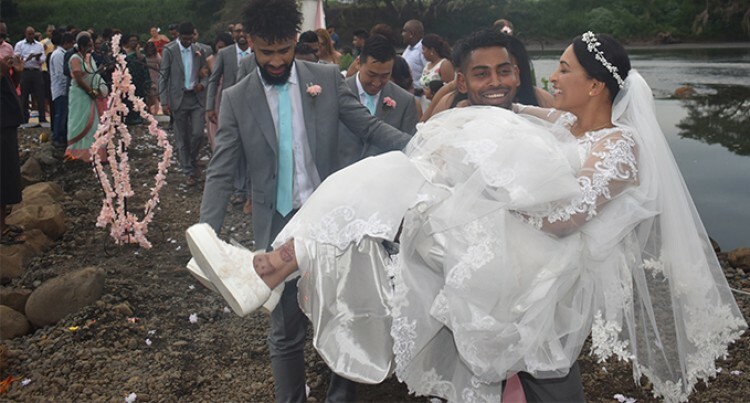 Fijian football captain and Wellington Phoenix striker Roy Krishna and magazine publisher Naziah Ali tied the knot in Ba yesterday after a four-day wedding event. With the sun setting on the horizon, Ms Ali was escorted by bridesmaids on a half cabin wooden boat while Mr Krishna awaited the arrival of the bridal party on the riverbank surrounded by a group of best men led by former Ba rep Alvin Singh. The two then exchanged their marriage vows witnessed by friends and family on a setting by the riverside at Vatulaulau, Ba. “I’m happy and was nervous at the same time,” the Wellington Phoenix striker said. “We were friends for a while after we first met then it grew into something more,” added Mr Krishna, who hails from Siberia in Labasa. Mr Krishna, who turns 31 in August, spoke of how their love story began. Ms Ali, 36, who has maternal links in Nailaga Village, Ba, said Mr Krishna popped the question last year around her birthday. “I will live between Fiji and New Zealand. We are waiting for Roy’s next contract. Depending on where he goes I will then decide to either get a replacement for my role or move over or continue splitting my time between Fiji and New Zealand,” she said. She has vowed to continue to support her husband in his football career. They plan to have two children. She thanked her mother and her extended family and friends, especially those who travelled from abroad. “My iTaukei and Indo-Fijian branches of the family have been incredibly supportive of our various multi-cultural ceremonies and we couldn’t have done it without them,” Ms Ali said. The couple had their individual haldi ceremonies and Naziah had a dua with her family earlier in the week while Roy had his at a Hindu temple. A tevutevu, mehendi ceremony and the wedding concluding with the reception. Ms Ali is a successful businesswoman and journalist. She held the title of Miss India Fiji 2009 and represented Fiji to the Miss India Worldwide Pageant in Durban, South Africa. She is currently the publisher of Mai Life Magazine. 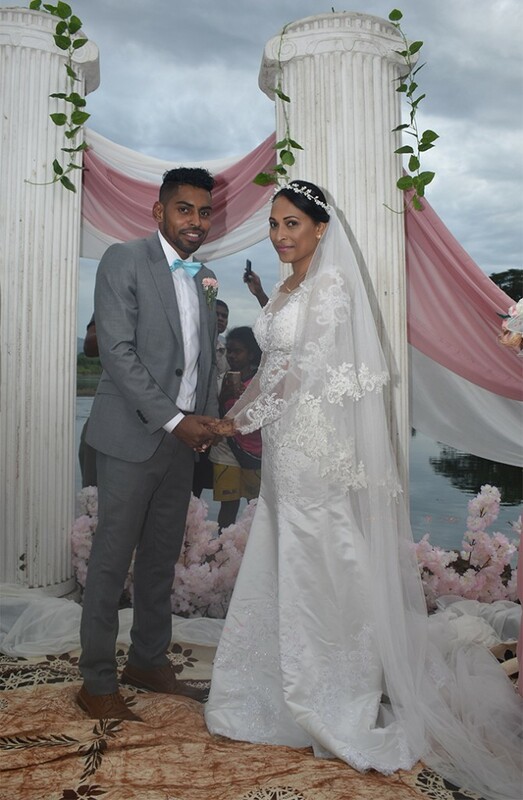 The newly-weds Roy Krishna and Naziah Ali in Ba on July 15, 2018. On the other hand, Mr Krishna made his debut in the local football tournaments for Labasa in 2007 and was impressive with the All Saints Secondary School football team for the Fiji Secondary School IDC. In 2008, he joined Waitakere United made 75 appearances and scored 55 goals for the club. In 2013 he joined Auckland United where he stayed before moving to Phoenix, the team he still plays for. Since 2007 Krishna has been a regular name in the national team and he became the first Fijian to score a goal at the Olympics Games in Rio 2016.